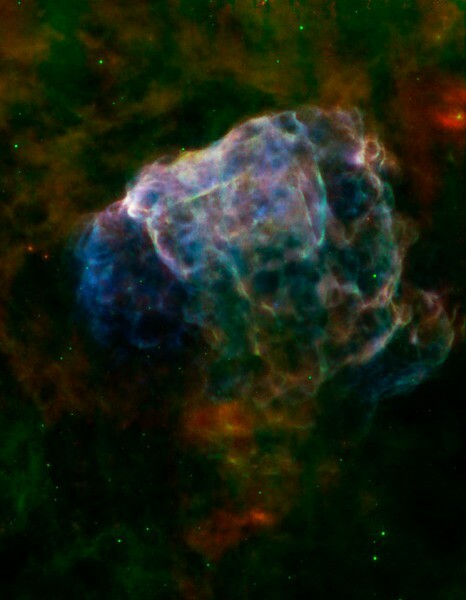 Puppis A (which you see in the picture) was a supernova that is 7000 years light exploded here and 10 thousand years now, 3500 years ago in light of its explosion arrived at Earth. Therefore, exploded 10,500 years ago. What you see now is the gas and dust of this star 180 light years occupying. But what he meant by this little writing, the show is not a pretty picture of the remains of a supernova but indicate that when we look at the sky looking a time machine. What we see is not what is happening at that time in the universe. If the light from Earth to Mars takes 8 minutes, when we look at Mars, we are seeing that planet, Mars, as it was eight minutes ago. When we look at the moon, which is 30 thousand kilometers, we are seeing the moon was made 0.1 seconds (if little, but hey, something has). So when we look more distant things, such as Puppis A, we are seeing things that happened long ago, specifically for that remnant of star 7000 years ago. So, folks, when you hearken to the stars, remember that what you see is the living history of the changing universe and you never know when does the sky one day arrived, humans get to that point you look.